You are adventurous, independent, logical, reserved, and very curious individuals. You like to figure out how things work. You have great mechanical and technical skills. You focus on ideas, theories and the explanation of how things work. You like to keep busy and are action-oriented. You appreciate and respect intelligence in others. You make decisions based on logic, it allows a person to categorize and analyze data. It is the ability to identify inconsistencies, know how things work and problem-solve. However, you will strongly resist being told what to do, which may present a discipline problem. You do not like to make decisions, and prefer to leave things open until the last possible moment. You're often unaware of how others are feeling, or how their own behavior affects others, When stressed out or upset, you may react with extreme emotions that are inappropriate or exaggerated for the situation. 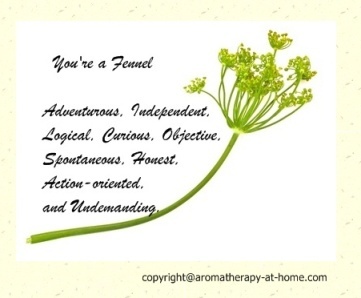 You can use fennel essential oils ( Foeniculum vulgare dulce) for these positive attributes : enlivened, motivation, fortitude, clarity, forceful, perseverance, courageous, reliable, and confident. Also for these negative attributes : mental blockages, boredom, unable to adjust, fear of failure, hostile, lack of creativity, hostile, overburdened.